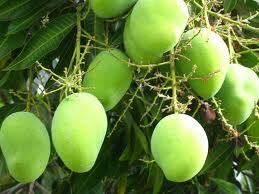 Mangoes are one of the most delicious and nutritious foods. Mangos are an excellent source of vitamins A, C and E. It also contain B-complex (anti-stress) vitamins, magnesium, potassium, phosphorus, selenium, Folic acid (folate), and zinc Mangoes are very low in Saturated Fat, Cholesterol and Sodium. Plus are a good source of dietary fiber. We can eat Mangoes raw, riped or cooked.